Yesterday the women’s road race was scheduled at the Olympic Games in Rio. Six riders from the Lotto Soudal Ladies team were selected for their country. Just like the men’s race it became a thrilling finale, unfortunately overshadowed by a severe crash of Annemiek van Vleuten. 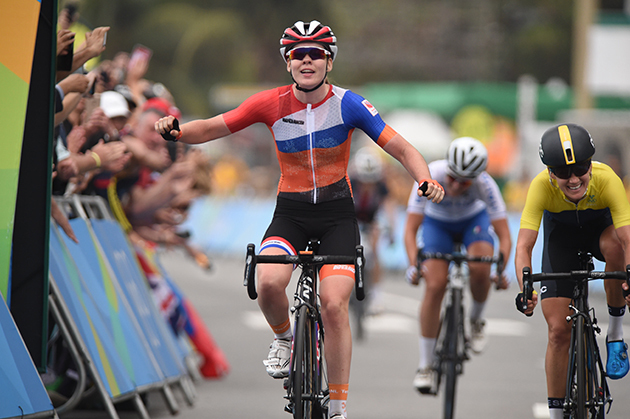 At the end the Dutch rider Anna van der Breggen could put on the gold medal at Copacabana Beach. Around noon the peloton left Copacabana Beach and set course to the Grumari Circuit, which they had to cover twice. Twenty kilometres after the start the Belgian rider Lotte Kopecky attacked. Soon she had two minutes advantage. A counterattack of the German rider Romy Kasper got neutralised and then a chasing group of five was formed: Armstrong, Bronzini, Plichta, Van Dijk and Worrack. In the peloton Emma Pooley, of Great Britain, raised the pace. When the advantage of the leaders got bigger again she jumped away from the peloton, but the others weren’t willing to let her go. With less than seventy kilometres left to cover, Kopecky and the five riders that had bridged to her were reeled in as well. A few kilometres further Germany, with Claudia Lichtenberg, came to the front of the peloton. Later they sent Trixi Worrack to the front again. She was part of a front group of seven, including the Belgian rider Anisha Vekemans. It was a strong group with also Cecchini, Ferrand-Prévot, Elvin, Jasinska and Vos. At the bottom of the 8.9 kilometres long climb of the Vista Chinesa Circuit they had an advantage of 1’18”. On the hard and steep parts their lead got reduced very quickly. Mara Abbott, from the USA, set a really high pace. The Italian rider Elisa Longo Borghini and the Dutch duo Anna van der Breggen and Annemiek van Vleuten were the only ones who could follow her. Before the top van Vleuten accelerated, only Abbott could join her. It started raining in the six kilometres long descent. Annemiek van Vleuten rode away from her companion, but then she had a terrible crash. That way Mara Abbott got alone in front. In the last hectometres she was caught by Johansson, Longo Borghini and van der Breggen. Van der Breggen beat Emma Johansson in the sprint and is the new Olympic champion. Longo Borghini took bronze. 7 August, 2016, Santa Rosa, California (USA): In the interest of increasing communication around the health and fitness of BMC Racing Team's riders, the team will release a regular update from Chief Medical Officer Dr. Max Testa on all rider injuries and illnesses. The update below concerns three of BMC Racing Team's riders. Richie Porte: "Richie sustained a fractured right scapular and multiple contusions in a crash in the Rio 2016 road race. He was taken for observation and X-Rays at Vitoria Hospital in Barra and will now return home for rest and recovery. At this stage no surgery is required as the fracture will heal with time. Richie will need a minimum of ten days off the bike, following which he can train on the rollers before working his way up to training on the road. He should be able to train normally in four to six weeks." Floris Gerts: "Floris sustained a fractured left collarbone in a crash during the warm up for the Team Time Trial at Vuelta a Burgos. He underwent successful surgery in Belgium to reduce the fracture, which required the insertion of a plate and multiple screws. He was discharged the day of the surgery and will be back riding on the rollers in five to seven days. We expect that Floris will be ready to return to competition in 30-40 days." Manuel Quinziato: "Manuel sustained a shoulder injury at the Tour de Polonge in mid-July. After some off the bike he started training on the rollers, and today has trained for the first time on the road. His recovery is progressing well and he will now concentrate on rebuilding his fitness on the bike and returning to race-form." 7 August 2016, Park City, Utah (USA): It was a case of the Empire Pass strikes back on Larry H. Miller Tour of Utah Stage 7 with the tough final climb proving decisive for both the stage victory and the overall General Classification. In similar style to Stage 6, it was a fast and aggressive start to the day's racing with attack after attack going off the front of the peloton as soon as the race hit kilometer zero. BMC Racing Team were involved in most of the early action before a group of ten riders were finally able to extend an advantage over the peloton after almost an hour of racing. As the breakaway reached the over the top of Wolf Creek Range, the race was exploding behind them with BMC Racing Team's Taylor Eisenhart, Darwin Atapuma and Joey Rosskopf all putting in solid efforts at the front to upset the rhythm of the race and put pressure on their General Classification rivals. At the bottom of Empire Pass, Lachlan Morton (Jelly Belly) launched an attack of the front of the main General Classification group, a move which saw him ride to both stage and overall victory. The race for the podium continued behind him with Atapuma and Adrien Costa (Axeon Hagens Berman) working hard to bridge the gap on the final climb of the week before a high speed descent into Park City sealed Atapuma's third place finish on the line. After showing his climbing abilities all week, Atapuma finished the Larry H. Miller Tour of Utah fourth on the overall General Classification, 1 minute 57 seconds behind Morton, while Rosskopf and Eisenhart were sixth and seventh respectively. The eight-rider BMC Racing Team squad took to the podium together as they won the Team Classification with an advantage of over 12 minutes. Darwin Atapuma: "I was feeling really confident going into today's stage and was wanting to attack earlier and earlier but I knew that the team was riding well and that they could help put me in a position to go for a podium finish on the stage. They were doing a great job supporting me and they have believed in me all week which I am grateful for." "I have been climbing really well but I just wasn't the strongest at this race today. A second and third place finish is obviously positive but to just miss out on the podium in the General Classification is a shame. As a team we have given it everything this week and we can be proud about that." Sports Director, Jackson Stewart: "Our plan today was all or nothing. We knew it was a big ask as we were pretty far back on the climb but everyone believed in our three guys in the GC and we knew they were really strong so we wanted to play all our cards." "It was a really incredible team effort today, as it has been all week. At the beginning Fabian [Lienhard] and [Tom] Bohli were going with the attacks. We also had TJ putting some huge efforts in on the climbs and then Joey's move was just an unbelievable ride. He really put pressure on Talansky and Costa, making them ride up front for a lot of the day and then was even able to finish ninth on the stage." "We wanted to make the race so hard today that teams would struggle to control it and we wanted to draw out the main GC rivals and really make them work for it. In the end, we had confidence in Atapuma and knew he was riding well but Morton just made a move right at the bottom of the climb and then could ride tempo all the way. We did our best, laid it all out there today and we can be happy with that. Cadel [Evans] was on the bus with us this morning and as he had won the stage here before he gave the team a pep talk and was excited for us to be aggressive and that's what we did." 8 August 2016, Santa Rosa, California (USA): BMC Racing Team returns to the fourth edition of the Arctic Race of Norway this week with a six-rider team eyeing stage wins. Sports Director Klaas Lodewyck said the team has multiple options for stage wins and the General Classification. "With the squad we have we will focus on stage wins because we have a really strong team, especially with some puncheurs like Philippe Gilbert. Looking at the parcours it is essential to not lose time on the first stage, and then there are two days where we have a good shot of going for the win. When you start winning stages, you're up there in the General Classification too," Lodewyck said. Philippe Gilbert is set to make his debut at the Arctic Race of Norway following his participation at Rio 2016. "It is my first experience at the Arctic Race of Norway but my brother raced there and told me it was super nice. My friend and former teammate Thor Hushovd is in the organization so I am very happy to discover the race and hope to make a nice result, but first I will see how I recover from the trip to Rio," Gilbert admitted. Rider roster: Marcus Burghardt (GER), Philippe Gilbert (BEL), Amaël Moinard (FRA), Daniel Oss (ITA), Michael Schär (SUI), Loïc Vliegen (BEL). TOUR DE L'AIN (2.1): Team Giant-Alpecin returns to France this week to take part in the 28th edition of the Tour de l'Ain. The four road stages will provide opportunities for the sprinters, climbers and attackers to meet the challenges of this parcours. The race begins with a flat course and will be ideal for the sprinters to seek stage success. Stage two will offer the first chance for the climbers to make their presence felt with two categorized climbs in the finale. On the penultimate day, the riders tackle five categorized climbs in the Alps, culminating with a summit finish into Lélex. The final stage is for the climbers featuring the iconic ascent of Le Grand Colombier. Coach Arthur van Dongen (NED) said: "We have chosen an opportunistic team as the stages offer several chances for us to challenge for results. We will race offensively with a special focus on the last two mountain stages. Indeed, with Sam, Jochem and Martijn we have some young and talented guys who will gain experience and can perform well in the mountains. 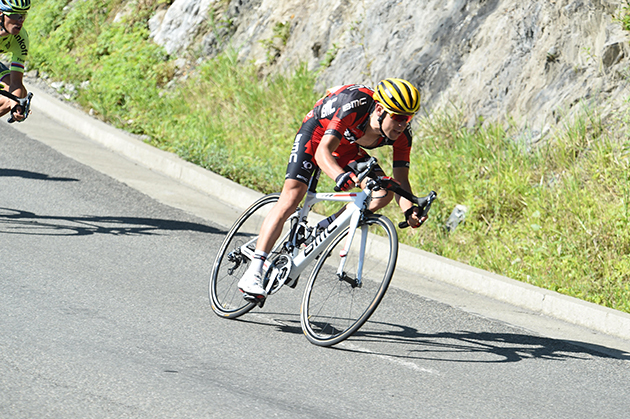 "The Tour de l'Ain is always a tough race and presents a good test for our stagiaires. Finally, it is an important last step for the riders who are competing at the Vuelta to fine tune their form." ARCTIC RACE OF NORWAY (2.HC): The team will line up in Norway to take part in the fourth edition of the Arctic Race of Norway. The race gets underway in Fauske, which will be a challenging day over hilly terrain. This is followed by a good opportunity for the sprinters on day two before a testing day three with an uphill finish, which should decide the overall classification. The race then concludes with a straightforward 193km stage, that the team can focus on for a sprint finish. "The main goal is to go for stage results instead of having overall classification ambitions in Norway," explained coach Dirk Reuling (NED). "Stages two and four will be our best chances for a fast finish and with excellent lead-out capacities we will set up the sprint for John. On the hillier stages, we have Søren who could be able to compete on the more difficult sections and aim for a good stage result. Finally, it will be the first race for our stagiaire Max [Kanter] and his aim here is to get used to our structure and way of working, and complete the race successfully." OLYMPIC TIME TRIAL: The men’s Olympic time trial will take place this Wednesday. The 55.5km time trial starts and ends at the Tim Maia Square and will feature a 1.2km climb. From Team Giant-Alpecin, Tom Dumoulin and Georg Preidler will be competing, representing the Netherlands and Austria, respectively. Both riders competed at the Olympic road race where Preidler took a 44th place. 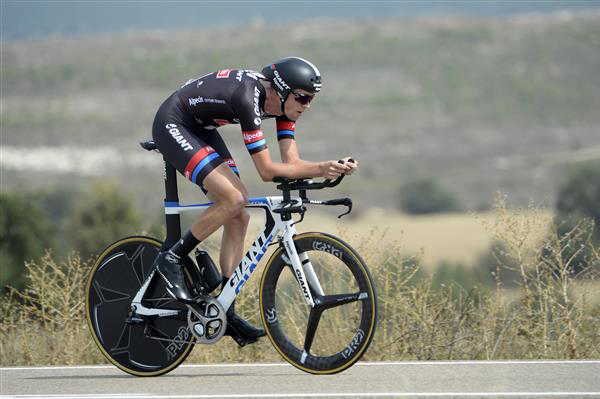 For Dumoulin it was a short adventure whereas he didn’t take additional risk to allow the healing process of his fractured radius to progress in time for Wednesday’s time trial. Team Liv-Plantur is pleased to announce that Lucinda Brand (NED) will join the team from 2017. The 27-year-old, currently with Rabobank-Liv Woman Cycling Team has signed a two-year agreement with the team, with more talented key riders are expected to sign for the team in the coming period. Currently tenth place in the UCI ranking, Brand has shown that she is one of the top riders at the moment. She is a strong all-rounder, good in difficult stages, the one-day hilly races and also has a decent time trial ability. Brand's experience will be valuable in the development of the team as it continues to evolve in becoming one of the leading cycling teams in the women’s WorldTour peloton in the short-term. Brand has shown her qualities in challenging races and has achieved some impressive results. Her best results include being two-time Dutch champion on the road in 2013 and 2015. In 2014 she took a huge win at GP de Plouay-Bretagne and the overall victory at Energiewacht Tour. Last year she won two stages at the Giro Rosa and she was runner-up at Boels Rental Ladies Tour in the general classification. Recently she sprinted to fourth place at the Prudential Ride London GP and last weekend she took her first season victory at the 1.2 race Erondegemse Pijl in Belgium. Brand said: "I am very happy with my contract at Team Liv-Plantur. It’s a great new challenge after four years with Rabobank-Liv. I am looking forward to moving my career in a new direction and this represents a great opportunity to challenge myself in several ways. The professional structure, staff, the team approach and its philosophy to top sports meet my ambitions. In addition, I will have the tools and some designated targeted races that perfectly fit my abilities to go for my chances and this overall picture is just what I am looking for." Team Liv-Plantur coach Hans Timmermans (NED) explained: "We have followed Lucinda's career for some time and have always admired her ability on the bike. Our objective is to be one of the leading teams in women's cycling in the short-term by applying the same ‘Keep Challenging’ approach as our men program, and the signatures of Lucinda and other talented key riders are important next steps in achieving that. Lucinda is one of the few riders who can naturally read the race, together with her physiological level and her loyal personality, we can help her develop into one of the best road captains in the world. On top of that, she is able to make use of her skills in the finish, which is clearly important for the most challenging races. Furthermore, we are intensively working to develop our sprint lead-out and she will play an important part in that process in order to increase the quality significantly. "With Floortje [Mackaij] and Sabrina [Stultiens] we already have two big talents for the future where development is pivotal. This year Leah [Kirchmann] has also joined, who has already achieved great results in the WorldTour, as she currently is third overall, proving she is among the world class riders at the moment. We have monitored great progression and we clearly see our way of working is paying off. Together we want to challenge the current leaders and through teamwork and a strong collective, we can be successful. Lucinda has vast experience and knowledge and she will be one of our leaders, as well as playing the role of road captain during the races and her presence will bring our team up to the next level."